Emilie Shapiro creates melded mosaic jewelry with an organic touch. Earth-loving ladies will adore this bold ring made with organic elements. Featuring rough-cut emeralds embedded in textured brass, this handmade ring blows all other cocktail rings out of the jewelry box. 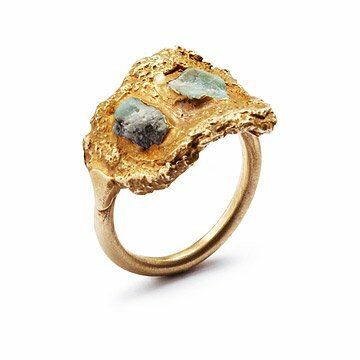 Maker Emilie Shapiro fuses the stones and brass in wax casting to create a uniquely natural form. Handcrafted in New York City. Please note that each ring is one of a kind and the stone size and shape will vary, as they are used in raw form. The artist cannot guarantee any shape, color, or texture of the stone in this ring.